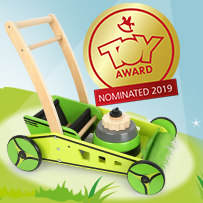 This wooden lawn mower toy has been nominated for a 2019 ToyAward and scored a place amongst the final three candidates for the 2019 ToyAwards, and is also a walking assistant for babies so that young walkers will really get their money’s worth! And here’s the special thing: Finally, there’s a toy lawn mower which also gives novice walkers a secure handhold! Instead of an unwieldy toy lawn mower made of plastic, the setting for novice walkers offers a stable and safe footing without the baby walker tipping over. The fresh colour design in bright green tones and a dynamic design make this lawn mower baby walker an absolute eye-catcher in the house and garden. It’s a guaranteed hot-seller that absolutely belongs in your spring and summer assortment! -A grip which has two position settings: for those first walking attempts by young novice walkers and for more advanced walkers. -The grass with Velcro pieces can be removed and easily cleaned. -The engine block is also a shape-fitting game and promotes the development of motor skills. This will certainly bring a fresh wind into your role-playing assortment!